Browns Point Lighthouse Park administered by Metro Parks Tacoma is the home for Point Northeast Historical Society's historical attractions and exhibits on the shores of Puget Sound. All are open to the public. Follow the informational signs for a self guided tour or connect with a knowledgeable PNEHS docent on Saturdays from 1-4, March to November. On Thursdays and Fridays facilities are open only when the Cottage is rented. Recently restored to its original 1903 condition. The three bedrooms, parlor, and dining room are furnished with antique items and look like they did with original lightkeeper, Oscar Brown. Displayed are such historic items such as a kitchen stove, toasters, dishes, pots, pans, and irons. Also set up is an old fashion schoolroom including desks with inkwells. Tended by Dash Point Garden Club, the garden replicates plantings once favored by the first light keeper and his wife, Annie. The museum's main attraction is a Coast Guard replica surf boat and pictorial display and video of showing how classic craftsman techniques were used in the building of this model by Points Northeast Historical Society in 1993-1994. Weighing 1200 lbs, the bell now hangs in what was the Pump House. 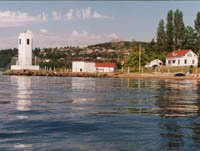 The current lighthouse replaced the original 1903 wood lighthouse in 1933. Today it is fully automated but is inaccessible to the public. The center occupies what use to be the crews quarters in the 1950's. It houses not only files of historic pictures and documents of interest to historical researchers but also rotating displays of historic events in the area. Books and memorabilia focused on lighthouses, history of the area, and other topics like Puget Sound Mosquito Fleet are on sale. Other Historical attractions in the area include Dash Point Dock and Dash Point School.